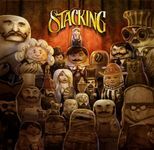 Stacking is a adventure/puzzle video game developed by Double Fine Productions and published by THQ. The game is based on the Russian stacking matryoshka dolls; set in a world populated by these animated dolls in the 1930s. The player controls the smallest doll, Charlie Blackmore, who is attempting to reunite his family that is being forced to work for an evil industrialist named The Baron. Charlie is able to jump inside dolls that are one size larger than him and control them, as long as the larger doll is facing away from him. If the player already controls a stack of dolls, that stack can jump into a one-size-larger doll as well. The player can also unstack the dolls at any time in order to enter dolls smaller than his current stack. Certain unique dolls, outside of Charlie, have their own special abilities—such as the ability to unlock doors, float to higher locations, or lure other dolls around, which can be used by the outermost doll. Thus, the player must stack and unstack the set of dolls possessed by Charlie to solve puzzles throughout the game. The various challenges for each mission contains multiple solutions, with rewards offered for finding all of them. For example; in a challenge where the player must clear out a lounge of rich people, players can either sneak in a poorly dressed man into the party, or have enough character flatulate into an art vent to clear everyone out. There are also rewards for completing side missions, discovering unique dolls, and finding and stacking a matching set of dolls. A free-play mode called "Hyjinks" allows players to enjoy the game without the structure of the game's story, and features additional rewards. Source: Wikipedia, "Stacking (video game)", available under the CC-BY-SA License.